The Comet offers a great blend of performance, versatility and ease of handling. Shorter and broader than a Laser 1 the light hull and simple rigging make it easy to rig and launch by a single sailor and reduce the time needed to get on and off the water. The boat sails well in light winds and is easy to reef in breezier conditions, making it fairly forgiving to newer sailors. While raced as a single-hander there is adequate room in the cockpit for a second adult or a small collection of children. The boat can specified, or converted between centre and aft mainsheet options, and like the Laser, mast and sail options are available to produce higher or lower powered specifications to suit various needs. 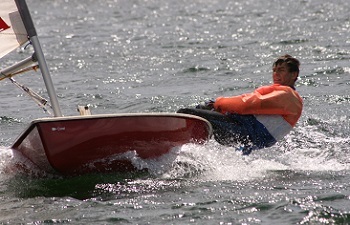 The original boat was designed in 1981 by Andrew Simmons who is still designing and manufacturing Comet dinghies today. Full details can be found on their website. There is also an active class association. This year’s Littleton 2018 Comet Open Meeting will be held on Sunday 9th September. Julian Holden, Comet Class Captain, is keen to encourage members and owners to make use of their Comets – either to race or enjoy cruising the lake. He keeps in touch with Comet sailors by e-mail and is happy to organise informal practice and training sessions. You will contact Julian by email at comet@julianholden.com. The club currently has one Comet to hire. If you would like to use this boat please contact Julian.